Once you have your solar panels installed on your roof you may wonder how often are you supposed to clean them. Being exposed to the elements, you have to take into consideration snow, rain, dust, bird poop… As panels get dirty, their energy output decreases, providing you with less energy. Dust and wind-blown pollen can block the panels from absorbing the sun’s rays. Rain helps keep the dust and debris off your panels but if you live in an area that doesn’t get much rain. Your chances of dust building up is greater. 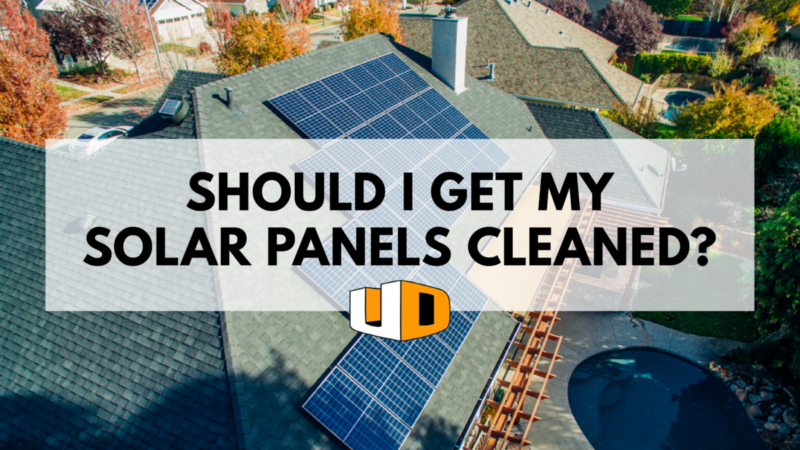 When asking “how often do I need to clean my solar panels” you need to consider these five factors. Your location, the angle and tilt of your solar panels, wind-blown dust that happens on a regular basis, the electrical rate of your panels and the costs to have someone clean the panels. You can opt to pay for a once a year cleaning or checking of your solar panels from your solar company. Most people in California live in an area that gets enough water to keep the panels clean. Making the dust issue not as bad as say someone who lives in Kansas. Los Angeles and the central valley being the exception to the dust issues. A study was done at University of California, San Diego. Finding that panels that hadn’t been cleaned or rained on in 145 days in California only lost 7.4% efficiency. Paying for a once a year cleaning wasn’t worth the investment. Home owners didn’t lose enough money by not having the panels cleaned to make it worth to have them cleaned. This was based on small scale solar panels. If you are a business and have a lot of panels it may be more of a loss for you not to have your panels cleaned. Investing in a once a year cleaning may be a good idea for you. The tilt of the solar panels on your roof does come into effect through out the year. The sun is higher in the summer and lower in the winter. So, it’s a good idea to adjust the tilt of the panels to maximize their exposure. When your panels are installed, you can decide if you want them fixed or adjustable. By having them fixed you maximize about 71.1% of your panels exposure. If you have it on a 2-axis tracker it will have 100% exposure. If you are a big business, a once a year cleaning might be something to look into. If your panels are stationary, keeping them clean is the only maintenance that is needed.